Is Uncle Tom’s Cabin a force for good, or is it just a mediocre book? More than any other written work, it helped to provoke the Civil War and hasten the end of slavery. In its day (it was published in 1852) it stood as a progressive vision of race and an affirmation of blacks’ humanity. Then again, as the book’s modern critics have argued, it entrenched pernicious stereotypes of African Americans that have persisted through the years: the mammy in her bandana, the sambo dancing wildly, the impish pickaninny, and of course the meek, submissive Uncle Tom. She was one of the blackest of her race; and her round, shining eyes, glittering as glass beads, moved with quick and restless glances over everything in the room. Her mouth, half open with astonishment at the wonders of the new Mas’r’s parlor, displayed a white and brilliant set of teeth. Her woolly hair was braided in sundry little tails, which stuck out in every direction. The expression of her face was an odd mixture of shrewdness and cunning … she was dressed in a single filthy, ragged garment, made of bagging … Altogether, there was something odd and goblin-like about her appearance. One tries not to miss the forest for the trees, but this racism is ugly and hurtful and difficult for today’s reader to overlook. Passages like this — the book is full of them — remind us that Uncle Tom’s Cabin belongs to a moment in time, and carried a social and political utility that does not depend on its enduring appeal as art, or indeed as morals. Stowe’s racial views were like Lincoln’s: benevolent but patronizing, progressive but not radical; ideal, it seems, to appeal to a large swath of the country. Had she gone any further, Uncle Tom’s Cabin would have reached far fewer readers. As it is, the book infuriated the entire South. As literature, Uncle Tom’s Cabin is pretty hammy, its style defined by maudlin sentimentalism. Yet as Reynolds notes, it was irresistible to nineteenth-century audiences, with “just the right blend of engaging storytelling and popular culture to make its higher-law, antislavery message palatable to many readers.” The narrative broadly follows the fates of two slaves sold by their gentle Kentucky master: Tom, who accepts his lot and, Christ-like, ends up whipped to death by a cruel Louisiana owner, and Eliza, who runs away, staying one step ahead of slave catchers as she and her family race to Canada. Although the story is exciting, the prose is sappy and melodramatic, the narrative interrupted by heavy-handed Christian proselytizing and awkward asides to the reader. One critic aptly labeled it Sunday-school fiction. Mightier than the Sword is a valuable and engaging survey of the book’s genesis and legacy, from its role in antebellum culture and politics to its echoes in milestone films and novels like The Birth of a Nation, Gone with the Wind, and Roots. Uncle Tom’s Cabin‘s greatest historical impact, Reynolds contends, was to awaken northern middle-class sentiment to the horrors of slavery. Squabbling anti-slavery factions united behind its message, and southerners grimly put it down and began closing ranks. The book was everywhere. Mightier than the Sword contains a fascinating discussion and photograph collection of the many Uncle Tom products (“Tomitudes”) that saturated the country, including card games, engravings, jigsaw puzzles, and trinkets. Slapped onto every snuffbox, Uncle Tom was as ubiquitous as a Disney character. As it happens, Mickey Mouse played him in blackface in 1933. Reynolds deeply admires Stowe’s novel — a little too much. He argues that her characters consistently exceed society’s limitations, and that the book “invested blacks with beauty and power to a degree that no other pre–Civil War novel began to approach.” This enthusiasm leads him to overstep, as when he insists that the Uncle Tom slur is a major distortion of Stowe’s character’s quiet strength and dignity. To Stowe, Tom’s goodness derives, disturbingly, from his “impregnable simplicity of nature, strengthened by Christian faith.” She believed that blacks are generally credulous and therefore more pious than skeptical, thinking whites. Reynolds pushes such objections to the side as cavils, to the point where he seems to be willing the glass more than half full. 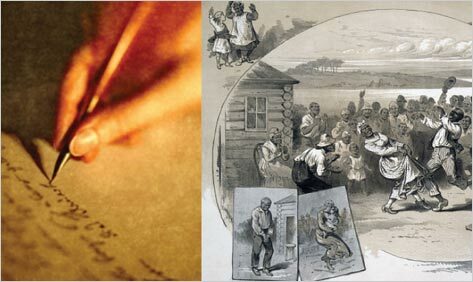 In truth, 160 years on, Uncle Tom’s Cabin deserves its mixed legacy. Thank goodness Stowe wrote it. But it’s a hard book for today’s reader to love. Michael O'Donnell is a lawyer who lives in Evanston, Illinois. His reviews and essays appear in The Nation, the Washington Monthly, and the Christian Science Monitor, among other publications.